Cookie Dough Fudge (using eggless dough) | How to make easy fudge! Cookie dough lover’s rejoice! You can now enjoy the flavor of chocolate chip cookie dough in an easy-to-make microwave Cookie Dough Fudge. It’s so good! When you whip up a batch of chocolate chip cookies do you find yourself eating more of the dough than the baked cookies? It’s so hard to resist digging into the bowl and sneaking spoonfuls of the cookie dough, isn’t it? 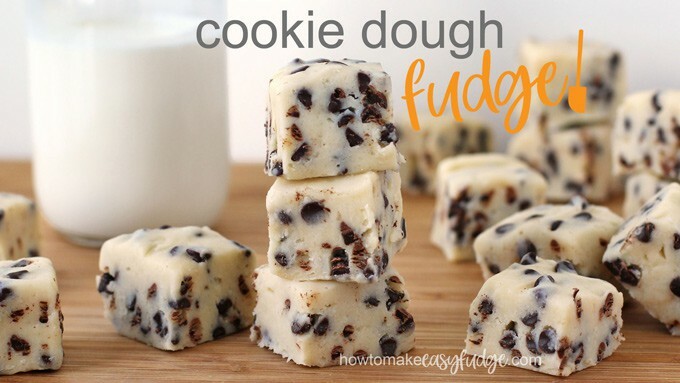 Well you are going to love this Chocolate Chip Cookie Dough fudge. It tastes just like the batter out of the bowl. What is cookie dough fudge? 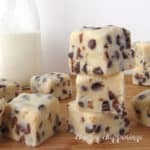 Cookie dough fudge basically blends together raw, edible, cookie dough with an easy, condensed milk, white chocolate fudge. Together the soft fudge speckled with mini chocolate chips tastes like the best cookie dough you’ve ever had and, best of all, it is safe to eat. Personally I have never been a fan of eating spoonfuls of raw cookie dough because of the safety issues of eating raw eggs and raw flour. I’ve been known to slap the hands of those trying to sneak spoonfuls of the raw dough before I get them scooped out and baked. I’d feel better about it if the dough were safe to eat. Well with this fudge there’s no need to worry because the cookie dough you will make to mix into this fudge is completely safe to eat! 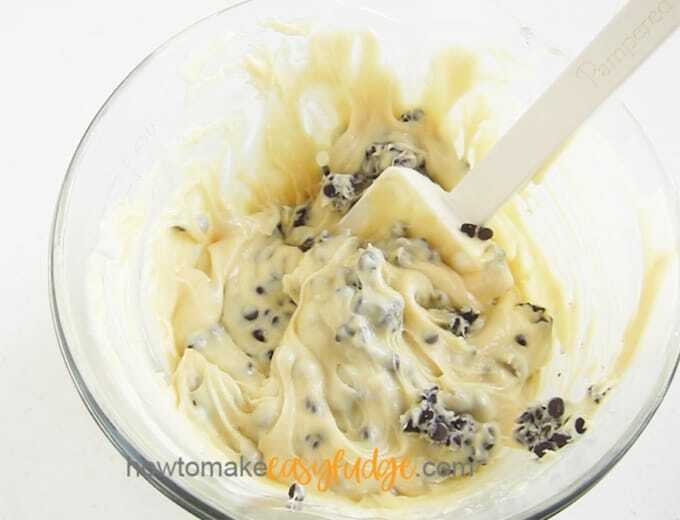 First you need to eliminate the raw eggs in a traditional chocolate chip cookie dough recipe. According to the US Department of Agriculture unpasteurized eggs may contain a pathogenic bacteria called Salmonella. Eating raw eggs may cause food poisoning so it’s suggested you just eliminate eggs from the cookie dough recipe. Eggs add moisture to the cookie dough so it’s best to swap it out for some milk. You also need to pasteurize (heat) the flour to eliminate the risk of e.coli which can be found in raw flour. You need to bring the flour up to 160 degree Fahrenheit in order for it to be safe. 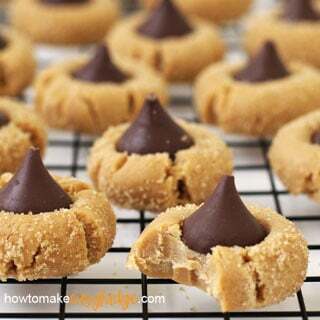 Either way you heat the flour you’ll want to allow it to cool before adding it to the other cookie dough ingredients. Pour it out onto a parchment paper lined baking sheet (a cool one if you baked it on one) and spread it thin then allow it to cool for about 15 minutes. When you are ready to add the cooled flour to the cookie dough you can simply lift up on either side of the paper then hold those two edges together and lift the paper out of the pan then tilt it over the bowl allowing the flour to fall into the bowl. It’s neat and clean and requires little clean up. If you have want to gift cookie dough to someone be sure to check out Meaghan’s post to see how she packages the cookie dough in the cutest little jars. Making this cookie dough is very similar to making a traditional chocolate chip cookie dough only you’ll add milk instead of eggs. 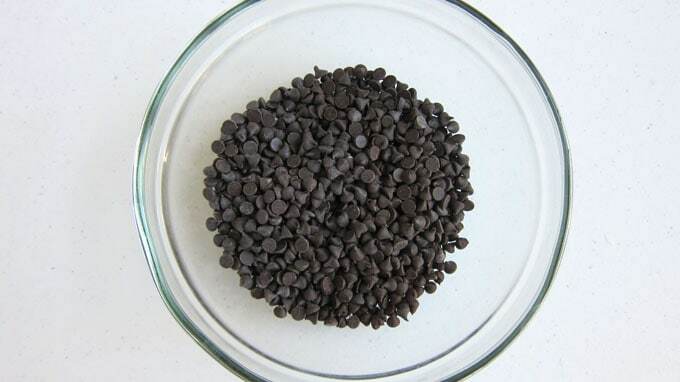 Pour the mini chocolate chips into a bowl and place them in the freezer for about 15 minutes. Chilling the chocolate chips will help to keep them from melting when they are stirred into the warm fudge. Beat the butter, granulated sugar and brown sugar together until light and fluffy for about 3 minutes. You want to make sure the sugar is beat long enough to dissolve into the butter so that your cookie dough fudge isn’t grainy. Stir in the vanilla and milk and mix until well combined. Add the salt and flour and stir just until mixed. If you are just making cookie dough you can add the mini chocolate chips now. 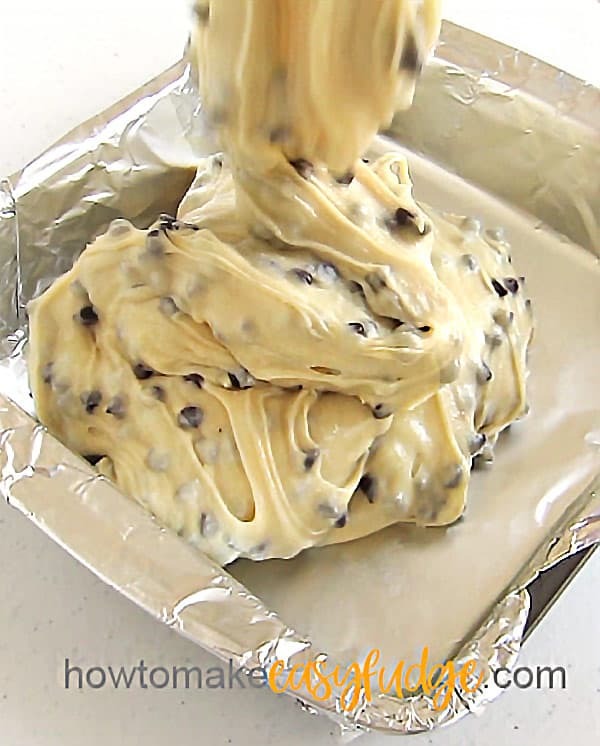 If making the cookie dough fudge you’ll wait to mix them in until the dough is mixed into the fudge. Stir together the white chocolate chips and sweetened condensed milk in a large microwave safe bowl. Heat at 70% power for 80 seconds. Let the bowl sit in the microwave for 3 minutes then remove and stir until all the white chocolate melts. If needed, you can heat the fudge up for another 15 seconds at 70% power. Stir in the cookie dough until it is well blended. Fold in the chilled chocolate chips. Pour into an 8-inch square pan that has been lined with non-stick tin foil or parchment paper. Cover and chill in the refrigerator for at least 3 hours until firm. Before slicing pop the fudge into the freezer for 15 minutes. Remove and peel away the tinfoil and cut into 36 little squares. What type of white chocolate should I use? I used Nestle Premier White Morsels to make this fudge. These white chocolate chips are actually confectionery coating. They do not contain any cocoa butter but they have a very nice flavor and taste great in this fudge. 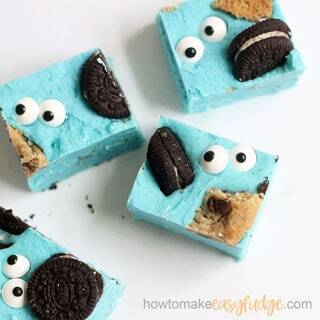 You can also use other confectionery coatings like Ghirardelli White Melting Wafers, Wilton Candy Melts, Merckens White Wafers, Peter’s Ice Caps, Candi-Quik, and even white almond bark. If you use a pure white chocolate candy bar or chips you’ll need to use 14 ounces. Pure white chocolate is a bit softer than confectionery coating so you need to add a small amount more to the recipe. Finely chop the bar so that it melts quickly. 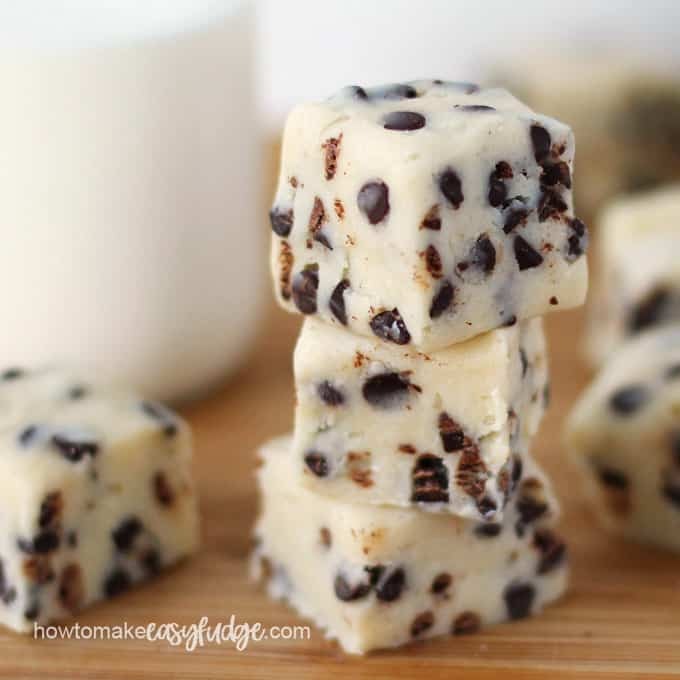 Can I use regular chocolate chips to make this cookie dough fudge? I highly recommend using mini chocolate chips because when you cut into the fudge you can cut through the small chocolate chips easily. Traditional chocolate chips will be much more difficult to cut through. 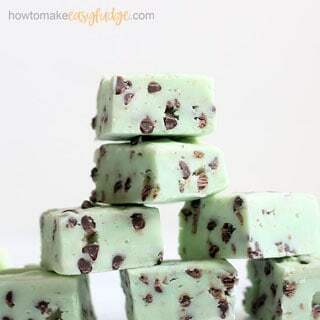 You can use mini chocolate chips to make Mint Chocolate Fudge too. Can I make double chocolate cookie dough fudge? 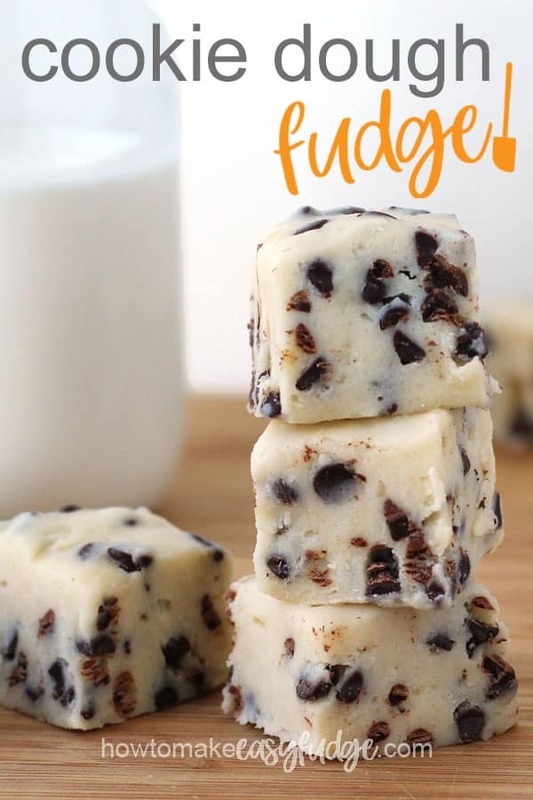 Yes, you can make this fudge using our milk chocolate fudge or even our dark chocolate fudge recipes but instead of mixing in the cookie dough, I’d suggest you make the chocolate chip cookie dough and scoop out small balls of the dough then blend those into the fudge. For a really fun flavor you could even use our caramel fudge recipe to make caramel cookie dough fudge. Yum! Just use 2 cups of white chocolate in the recipe then blend in the cookie dough. We have found that national brands of sweetened condensed milk like Eagle Brand and Borden are thicker than grocery store brands. 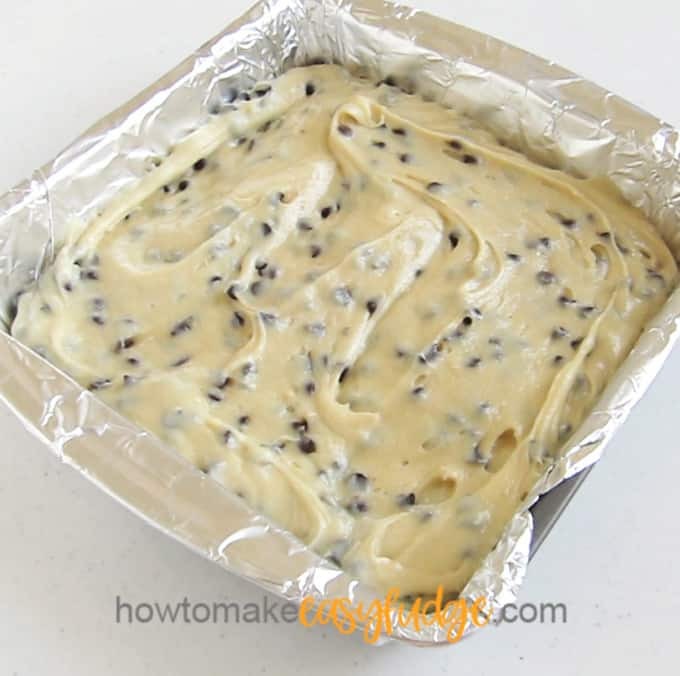 If you use a grocery store brand of sweetened condensed milk you may want to add an additional 1/4 cup of white chocolate chips to the fudge in order to ensure the fudge sets up properly. Can I sprinkle the top of the fudge with chocolate chips? Yes! I didn’t because I thought the fudge had enough chocolate in it but if you want your chocolate chip cookie dough fudge to be extra chocolately then by all means add more chips on top. Just know that when you go to cut the fudge that many of the chips, especially those around the cut edge, will fall off. Does cookie dough fudge need to be refrigerated? I do recommend refrigerating this fudge for up to 3 weeks or freezing it up to 3 months. To store the fudge in the refrigerator, wrap it in wax paper and place it in a zip top bag or an airtight container. To freeze the fudge, I recommend wrapping it in wax paper or parchment paper and then over wrapping it in Press ‘n Seal or tinfoil and placing it in a zip top bag and removing as much air as possible. To thaw frozen fudge remove the fudge from the freezer and place it in the refrigerator overnight then bring the fudge out and allow it to sit at room temperature still wrapped for at least an hour before opening. This will help keep condensation or ice crystals from forming on your fudge. 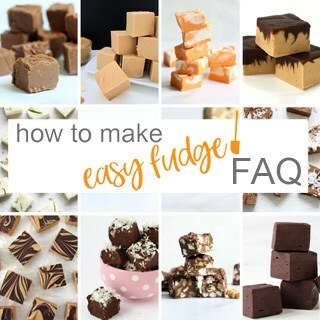 You can see more tips and tricks for making perfect fudge on our easy fudge FAQ page. Cookie Dough Fudge is a cookie dough lover's dream dessert. It tastes just like chocolate chip cookie dough, is safe to eat, is easy to make, and is oh, so good! NOTE: If using white confectionery coating chips (no cocoa butter listed in the ingredients) use 12 ounces or 2 cups, if using pure white chocolate (with cocoa butter listed in the ingredients) then use 14 ounces or 2 1/3 cups. Line an 8 inch square pan with non-stick tin foil or parchment paper. Pop your chocolate chips into the freezer for about 15 minutes, until you are ready to stir them into the cookie dough fudge. Pour the flour into a microwave safe bowl. Heat for 30 seconds on high power then stir. Heat for another 30 seconds then stir. If you have a thermometer check the temperature of the flour to make sure it has reached 160 degrees Fahrenheit. If it's not hot enough or just to be safe if you don't have a thermometer, heat for another 15 seconds then stir. Spread the flour onto a parchment paper lined baking sheet and allow the flour to cool for about 10 minutes. In a mixing bowl, beat the softened butter, granulated sugar and brown sugar until light and fluffy. Add the vanilla and milk and beat to combine. Sprinkle the salt and flour over top and beat just until blended, then set aside. Combine the white chocolate chips and sweetened condensed milk together in a large microwave safe mixing bowl. Heat in the microwave at 70% power for 80 seconds. Let the bowl sit in the microwave for 3 minutes before removing and stirring. Stir the cookie dough into the melted chocolate. Pour the fudge into the prepared pan. Cover and chill for at least 3 hours until firm. Freeze the fudge for 15 minutes to make it easier to cut. Remove and peel off the tin foil or parchment paper. Cut the cookie dough fudge into 36 small squares. Store the fudge in an airtight container in the refrigerator for up to 3 weeks. Wrap well in wax paper then overwrap in tin foil then place in a zip top bag or airtight container to store in the freezer for up to 3 months. To thaw, place the fudge in the refrigerator overnight then set the fudge on your counter and allow it to warm to room temperature for about an hour before opening the packaging. We hope you enjoy making this easy, homemade, microwave cookie dough fudge. If you like this recipe be sure to leave a comment below and click on the stars to rate the recipe as well.